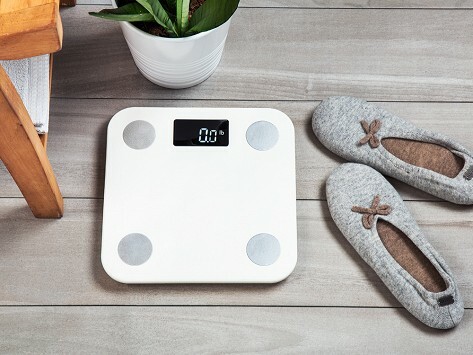 The Bluetooth Yunmai mini smart scale gives you big-picture health information beyond weight in a slim, compact design. Bioelectric Impedance Analysis (where a safe electrical current is sent through the body) measures health metrics like body age, BMI, hydration and more, and stores it all in the app. Here you can track changes, check healthy benchmarks, set goals, and sync with other fitness and health apps. Dimensions: 10.2" x 10.2" x 0.7"
I like that it tracks any changes. Yunmai smart scales go well beyond typical weigh-ins by measuring other metrics to give you a bigger, better picture of your overall health—things like body age, hydration, and bone mass, which many of us typically don’t know about or have a way to access. Through Bioelectric Impedance Analysis (where a safe electrical current is sent through the body), a scale gathers information that is then stored in a companion app. Here you can keep track of measurements, set goals, or sync with other health apps. The premium and mini scales share the same measuring functionality in different sizes to suit your space, and can both handle up to 16 different users. It’s an easy and accessible way to stay on top of areas you want to focus on or gain a deeper understanding of your body and health—all of it.